what is with this weather??? i wore two pairs of sweatpants and a sweatshirt to bed and was still chilly. jeezus. our apartment seems to absorb cold...maybe that will be nice when it gets hot. this morning i woke up again to the sounds of cats attacking/getting attacked. i hate cats. so i had class in ipanema and felt awful, from lack of sleep and from a cold i seem to have gotten from it being cold, but it was ok. i came back briefly and then went to centro for my new 12:00 class at the same oil company i have class in on monday/wednesdays with a lovely lady who understands probably 20% of the words that come out of my mouth. she is very sweet so it's hard to lose my patience with her but she barely understands anything. oy vey. on the way back home, i saw the sad homeless man playing a flute (??) and this young hip couple at the pet store near our house, getting onto a motorcycle after buying pet stuff, with a shaggy Yorkie strapped to the chest of the woman in one of those baby holders. 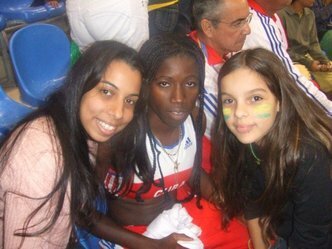 oh rio. now eli made lunch so let's see if it's edible yay...then class again at 6. and food shopping! ps. yesterday i forgot to add that all the teachers at the kids school have to wear smocks. and all the kids have little backpacks and tee shirts with the school logo, even though it's an after school program. oh man. Update: so i went food shopping today and got a reasonable amount of food for a reasonable amount of reais but i am growing increasingly broke as i have to pay my rent tomorrow. it's not fun. eliseu is out getting a pizza and a movie so we can have a nice little night in. i am pretty exhausted so it should be good. i had class in centro at 6, but it was pretty easy since the guy is almost fluent. those are the best. also, i saw a guy on the bus today selling pens who had long manicured and painted fingernails and huge gaudy rings, but he wasn't pretty enough to be a drag queen. weird. anyway. i have another long day of classes tomorrow so...off i go. today was my first real day of classes. they began as such. i couldn't sleep because i was worried i'd sleep through my alarm, but luckily had no trouble getting up because there were two cats outside dueling for a bird or a rat or something and they were annoying and loud. so i went to centro and found the building for my two morning classes, which is in this huge office building that was probably sleek and modern in the 70s but now looks like something sleek and antiquated. So I got a guest pass and then I saw the building was pretty modern after all: before you get to the elevators, you have to punch in your floor on a big screen and then it tells you the letter of the elevator, and you get on the elevator and it has no numbers, and just knows which floors were punched in. cool. so then i got to the floor and the doors were locked and there was no buzzer, so i started to wait. then there was a phone and it started to ring but i felt weird about picking it up because, it's a phone. so then it kept ringing and it was a security guard watching me from somewhere (creepy) and he called someone to let me in. so then i had 2 hours of classes with these guys who drive the executives (mostly foreign ones) for this multinational oil company. they are pretty challenging but are at least entertaining. also the office is awesome and has a sweeping view of Guanabara Bay and the city, and these gorgeous offices with Brazilian art relics and modern artsy meeting tables and lots of snacks and coffee and stuff. it will be nice. then i went to meet my boss who was going to take me to my 1130 class, which is far, but she luckily called the office in time to find out the guy had cancelled (good sign, huh). That's ok because I get paid when people cancel on the day of class, I think...I might be making that up. So we chatted and she showed me how to get there and she told me this ridiculous cold is as cold as it gets (thank god). so then i went home, got some lunch and loaded my pictures, planned my lessons for tomorrow, and headed out to my kids classes. i love the ride to barra because the buses pass along all the beaches; today there were HUGe waves and despite the ridiculous cold there were people surfing!! so the school is in a ritzy open air shopping mall in Barra, and I am the only American working there. it's for kids from 1 (!!) to 13. since english schools in Rio are like starbucks to New York, these places have to do all they can to stand out and get clients. their facilities are not huge but are beautiful and incredibly clean and organized and high tech and i was quite impressed. so i observed two lessons today, each 1.5 hours. the first was 2 8 year old girls, who spoke better English than some of my adults. they were adorable and so smart and it was really fun; that will probably be the easier group. the next one was 3 4 year olds, the cutest things EVER who actually do manage to understand and get out a few words. children are so smart with languages it is quite amazing...they're like sponges. the way they organize the classes are these huge books of lesson plans that they put in a crate with all the materials, and then you have to read it and figure out what to do. the only prob is that the plans are written in a very lacking English, and as a university-educated native speaker I had trouble understanding what the hell they wanted us to do and what materials we should use. i can see creativity will be important. the other teachers speak fluently but definitely not perfectly and it will be good to have someone speaking some...shall we say, correct English. They're fine but these women would have trouble getting regular jobs in English speaking countries, at least teaching. i met one really nice girl my age who i want to make friends with; her dad works in DC!she has a really cute accent and says "my goodness!" almost everyone other word. i liked her better because she actually showed me what the hell to do and where to find everything. everyone communicates in English because they don't let the kids speak Portuguese so they try not to either. so they give the younger kids snack, and take them to the "mall" which is this shelf of cheap little toys that the kids get at the end of each class, which i find pretty funny since the school is IN a mall but ok. the kids are incredibly wealthy; one girl told us she just got back from Bariloche, this ritzy ski resort in Argentina, and that the two older girls each had their own bedrooms and bathrooms. also the two older ones were also fluent in at least one other language, french and german respectively. these kids are going to be so good at English by the time they're even preteens. it made me think that money really can buy knowledge and access, and made me more determined to work with kids who don't have these kinds of opportunity. i was happy to find the bus stop was close and i got home pretty fast, watching the full moon over the ocean. eli is making dinner (!) so i'm going to go because i'm starving. i think i'm a little panned out. on saturday eli and i got up and went back to the new stadium to see the last day of Atletismo (track and field), which was fun even though it was freezing and raining all day. we had more expensive seats on saturday so we were right in front of the middle of the track, and it was great, albeit a little wet. the pole vaulters had so much trouble on the slippery track that only a few of them even cleared the bar. it was pretty miserable but brazilians persevere so it was still fun. we stood up and sat down constantly for the various medal ceremonies and listened to lots of national anthems, and saw the relays, and javelin, and discus, and this weird thing called steeple chase where it's long distance but they have to jump over these things. we also saw DR win bronze in one of the relays with Sanchez!!! 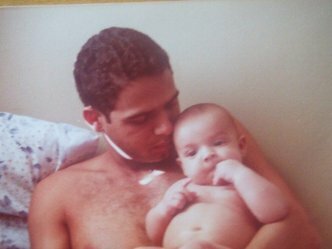 que saudades. a word on the weather this weekend. Friday was chilly, but comfortable. However, the rich/middle class women of Rio decided it would be their only opportunity all year to show off their winter clothes and busted out like they were in the middle of a blizzard. (Kind of like LA ladies, too). I saw one woman in a full length wool coat and knee-high leather boots. I bet she was schvitzing like crazy, but she thought she looked pretty cool. now, saturday and sunday i can geniunely say were COLD, mostly because of the rain. i, being dumb, decided to wear flipflops and was very unhappy, but luckily i brought a jacket or i would have froze. it just seems ridiculous it would have been this cold this weekend after i passed out from the heat last weekend. everyone was bundled up all weekend. 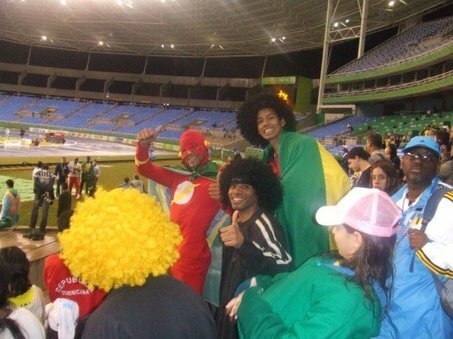 anyway so we stayed for the last medal ceremonies and saw these crazy fans, one dressed up like the Flash and the others wearing afro wigs, who did a danca do siri (the Crab Dance) to get on TV. Click on the link to see it on Youtube. The Crab Dance is this weird Brazilian thing that's a victory dance where you...dance like a crab. The athletes sometimes do it when they win something, like the Brazilian basketball team who won gold (something is seriously wrong with the US team for not even getting a medal), who also did the traditional victory move, o peixinho (the fishy), where everyone runs and slides on their bellies. Brazilians are weird. so after about 6 hours of track and field we went to eli's parents house and warmed up and ate and fell asleep. the next day, eli's cousin, his cousin's husband, his uncle, and his second cousin came over for lunch, since they were in Rio for the weekend. 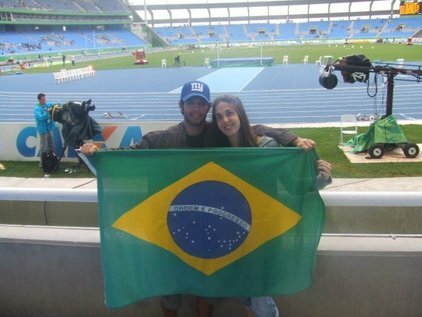 They all live in Minas Gerais, where Eli's mom is from, the "interior" of Brazil, and a state adjacent to Rio state. They are the equivalent of our Neufelds, and were funny and entertaining, so we hung out and watched the rest of the Pan with them. The best thing we did, though, was Eli found a box of old photos from when he and his siblings were kids, and they were absolutely amazing, even though I'd seen some of them already. They were such cute kids, and his cousins were so funny when they were little. I took pictures of a few so you all can see them. I will post all my pictures tomorrow if I can, but since I have a whole bunch of classes I might not have time. 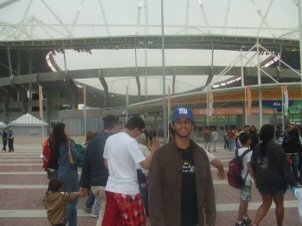 Then I bugged Eli to leave and we came back, and saw fireworks from Maracana on the way, where the Closing Ceremony of the Pan is happening as I write. We're watching on TV, and they just had a huge beautiful musical presentation of musicians and dancers from Mexico, where the next Pan will be in 4 years. At the end of it they played with Brazilian gauchos (cowboys) playing traditional music. then they did this thing where all the volunteers dressed in the 5 "Pan" colors and made the symbol of the Pan, five birds of five colors, on the floor of Maracana. Then they had dancers doing all sorts of Brazilian dances, and on top they had 2 European-looking ballerinas doing ballet who then busted out into samba with people dressed as Africans and indigenous people. Very cool. These games really have gone incredibly well, for here especially, with very few kinks and just really well done. Now let's talk about Cuba. 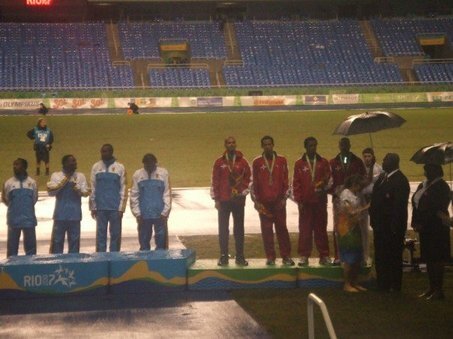 It came in second behind the US in number of gold medals won, and in track and field they won a ton of medals. But one thing I noticed that was weird was that the Cubans were oddly stoic, especially when receiving their medals; no crack of a smile, or mouthing the lyrics to the anthem, like most of the athletes from other countries. We took a picture with one athlete on Friday, who didn't even smile. Then yesterday, Fidel announced that all the athletes had to come home a day early, even though the men's volleyball team couldn't get their medals and the marathon runners missed their event today. Apparently someone found out about a plan for a mass defection, sometime in the next few days. Four athletes defected earlier in the month. So Fidel got a Cubana plane and ordered them all to go home. Here's the story on BBC: Cubans . It really brings to light what these people are going through, since Cubans are forbidden to travel, unless its for something official to represent the country, like the Pan. It makes me think that maybe a lot of the athletes said goodbye to their families and had plans ready to defect. It's really heart-breaking. A few words on the Pan, while I'm reflecting. I love events like this that unite people and force people to cooperate, even in the spirit of competition. Latin America, and the Americas, are so fractured and troubled, and events like this show that cooperation is possible. Though nationalism is important, and good lord I think politicians and corporations use events like this to stir optimism and voting and spending, but at the same time it brings different people together and helps everyone learn about other cultures and that some of us are more similar than we may think. Eli seems to think that now all the violence and mess of Rio will resurface again, and Rio will go from being shiny and clean and happy to its normal state; or that the media has just been ignoring the violence in favor of the Pan and to show the world a different side of Rio. I think this event was great for Rio, aside from it not really benefiting the majority of its residents, because it proved to the world that Brazil is capable of being a world power, that they can pull something like this off just like any developed country. Well. I am still not in the best of culture shock moments and still feel pretty desanimada about everything, and the Pan has helped distract me. Now that my real "teaching career" is starting tomorrow, I don't know how everything will go. So I'm going to try to condense this since we are going back to track and field again today and need to eat and get ready. yesterday i went into the office to get my materials and info for my new classes starting in August and as expected, it took twice as long as it should have, and so i ran home as fast as i could to drop the books off and eat something, and then went back to centro and met Eli at Central Station. Then we gloriously got an express train to the new stadium, a little further down than Maracana. 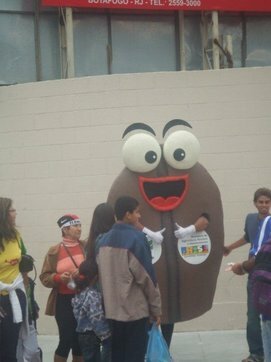 We ran into one of Eli's old friends who was doing this weird advertising campaign with a huge group of young people dressed in sports clothes advertising Brazilian coffee and carrying around various sports equipmenty things, like tennis rackets and basketballs, with a guy walking around dressed as a coffee bean (i took pictures). His friend looks curiously like my dad when he was in his 20s, with blonde curly hair. weird? anyway then we met Eli's whole fam complete with brother's girlfriend and Eli's cousin who's still here, and we all went in to the gorgeous new stadium at about 2, and left at about 8.
we saw aLLLLLLLLLLLL sorts of track and field, which we will also see today. we saw the 10,000m which was painful to watch it was so long, and the women's 5000m which was won by this sneaky Canadian who stayed in the pack until the veryvery end and then pulled ahead and beat the American in front. We saw lots of events with hurdles and I was very sad because Felix Sanchez lost big time during his event. oh well. 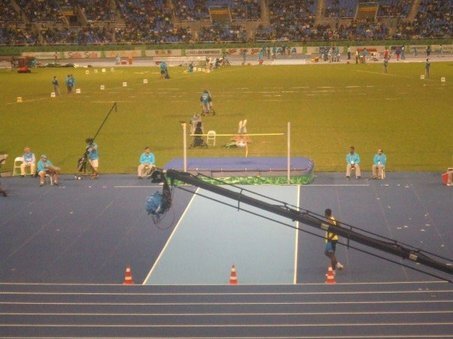 we were on the south side of the stadium, so it was hard to see javelin and the one where they throw the heavy ball and the long jump, but incidently we were right in front of the high jump, my favorite, so we saw that very clearly. and we were near the starting point for some of the races. 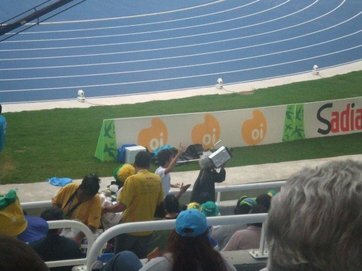 as i said, brazilians get really excited when its any sport and any brazilian is playing so everyone was very into and cheering the brazilians on. they won a few things but the cubans and canadians dominated all day. the cool thing was that a lot of the athletes wound up in our section at the end, since high jump was last, so we got to see a bunch of them and take pictures with them. we also sat right next to an actress from a novela. one noteworthy thing that happened was that as usual, we didn't sit in our assigned seat, but about 2 rows down from it in the general vicinity. a guy and his wife and kid came over at one point and insisted we were in his seats, but we pointed 3 open seats right next to us that had the same view, but he got belligerent and insisted everyone move, which we didn't. then he went to complain, but we didn't see him again so i don't know what happened. after that eli and i came home, ate dinner, and then went out with my friend Erick, from my DR study abroad program, who's in Rio this week after living for awhile in Chile. It was awesome to see him, since he's the first friend of mine from the US who has been here. he was with some friends so we went to a bar to drink and catch up and then to a little club in Lapa (they played REGGAETON i nearly cried with joy, though it was only 2 songs) and then we got fed up of the smoke (smoking is not prohibited in clubs here) and negotiated with a cab to go home at about 4.
oh, how could i forget. before meeting erick, we went on a mission to Find An ATM, since neither of us had enough cash to go out. I definitely learned my lesson. After going to 3 banks in Botafogo, 5 in Lapa, and even trying to work out a deal at a lanchonete and a gas station to give me cash we could not get ANYTHING. Apparently, ATMs here close at 10, and if you don't make it before then, you are screwed. No luck. No cash. I guess it's for security reasons, but it's absolutely ridiculous. So when we went to the bar I paid on my card and everyone paid me in cash, and I had the exact amount we needed for the rest of the night. So today I am going to the ATM. During the day. I think we are going to Eli's parents house again for the night (like I said, this is not usually optional), I will try to update online tonight. I have pictures so maybe I can get them up soon. i feel like today has been two days. i woke up a little before 7 and went to teach in Ipanema, and then came back and fell asleep until 1. OH! I saw the crab man again today. He was passing the bus stop at about 7:30. Today he must have had a better catch because he was pushing an entire shopping cart full of crabs, most of them strung together and hanging in clumps over the sides of the cart. brazil. after i got up again i watched the end of the Brazil women's soccer game against the US women, and Brazil killed them 5-0. They were so cute and happy and dancing and crying (they won the gold). Though this is a very machista country, I feel like there is a lot more support of women athletes, at least during international events when Brazilians rally around them as equals representing their country. 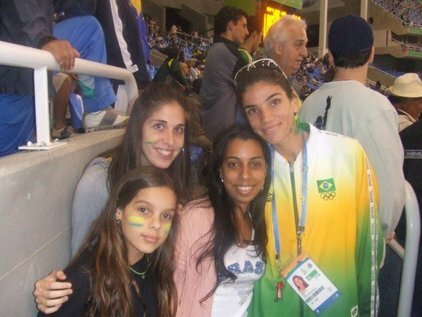 Marta, one of the soccer players, is the best woman soccer player in the world (at least according to the Brazilians). Maracana was packed today and everyone stayed to watch them receive their medals and have a big party. If only American women athletes got that kind of respect. Here is a picture of the women winning from Globo News, the headline which read: Brazil Humiliates US and wins gold. so eliseu went to work and my second class of the day was cancelled and i felt super blah and wound up just going to the mall down the street. i had a pizza craving and got some delicious pizza. i saw that there is this fancy japanese restaurant overlooking the bay that looks great. mm. after that i went shopping, though i got discouraged pretty quickly. i first went to this store called "Leader" (in English) which was kind of like a JC Penny type thing but stuff was STILL expensive. I guess I shouldn't assume that everything in Latin America is cheap but I think clothes are actually more expensive here than in the US. But generally speaking the material is also really inferior to a lot of our clothes, which is why I have a big problem paying $25 for a shirt. I dropped $30 on just 2 items there, and then went to a bunch of other stores. One was called Old Factory (also in English) which was funny because it was women's clothing for young women that want to dress like old ladies. I passed this store called Taco which is a GAP rip-off, from the $60 sweatshirts to the blue and white logo and type font of the name. I went to a bunch of other places and tried stuff on--I wanted to get some more Brazilian clothing to blend in more--but the prices and materials sucked. I finally got fed up when this woman started following me around the store shoving items in my face (and REALLY ugly ones), and got ice cream from McDonald's and left. I suppose there are things I could be doing right now, but all I feel like doing is curling up and reading HP. It's also REALLYCOLD for here today so anything outdoorsy is not so great. tonight i think i am going out. today i was reading in bed and all the sudden i heard some random instruments that sounded like they were right outside the apartment. then all the sudden a whole band started playing. So me and eli went to the window, and sure enough, there is a bossa nova band playing on the patio of the building adjacent to ours. They've been playing for about an hour, and they are awesome, and we get a free bossa nova concert in our own house! i think they played a bossa nova remix of the wedding march so maybe they're going to play at a wedding. i took video so if i can ever figure out how to get video on here i'll upload it. one thing is for sure: staring out my window up at the Corcovado listening to bossa nova outside? just a little magical. ...is a type of music, a mix of American jazz and Brazilian samba, first introduced in the late 1950s in Rio. "The Girl from Ipanema" is bossa nova. I don't really like jazz that much but I really like bossa nova. It's really relaxing.